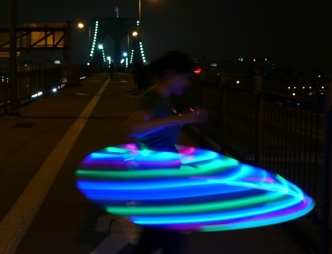 You can add a rechargeable battery to your LED Hula Hoop with a few extra parts and a few more cuts and connections. The battery will last 6 hours and recharges in only 1 hour! This has a DC jack that snaps into a simple round hole on the outer diameter of your hoop right next to your switch. The best time to make this modification is while you are making your LED hoop and BEFORE you cut holes for your switch. So FIRST follow my instructions to build your LED Hoop it will direct you to stop before Step 7 and start following instructions on this page shown below. If you have already made your ProdMod hoop and wish to add this upgrade, it can still be done. Read through the following instructions before you begin. See if you have any space for a DC jack between the switch and the connector like I show in the photos, if so you can follow what’s on this page. If you don’t have room between the switch and connector, STILL FOLLOW the wiring schematic below, but place the DC jack on the other side of the switch. If you need more help please contact me and I’ll draft special instructions. Here is a simple diagram to show you how the LED wire, switch, DC jack and battery are meant to connect to each other. We will call this METHOD A. You want the switch wired between the LEDs and the DC jack because you should keep the LEDs off while you are charging the battery. The switch is only connected to one of the wires, in this case the positive rail shown in red. It breaks the connection to the LEDs. The DC jack is connected in parallel to the LED wires and the battery. Make sure you identify which terminal on the DC jack is positive and which is negative. Lets take a look at it right now. The jack is “center-positive”. This means the center pin should connect to the positive wire of the battery. In the photo the positive terminal is the one on the left that has a round plate attached to the center pin. The negative terminal is on the right. METHOD A makes the proper connections using the least amount of wires. But it can be challenging to solder the connections. The remainder of this tutorial will follow Method A. If you find this too difficult there is another way that we will call METHOD B. After you connect your switch you leave the remaining wire in the tube and connect it to the battery as you would with a standard LED hoop. This may be an easier method for those of you who already made a ProdMod hoop and are upgrading to Rechargeable. The LED hoop kit includes 12 feet of wire, so you should have about 1 foot of extra wire after the battery is connected. Take that extra wire or another set of wires and connect it to the DC jack. Then send the other end of the DC jack wire in through the DC jack hole and out the tube connector towards the battery. Connect that DC jack wire directly to the battery wire. So you now have two sets of wire on the battery. One set from the LEDS and switch, the other set from the DC Jack. Now push the DC jack into the hole and you are done. See image below for some guidance. Note that the components will sit on the outer diameter of the hoop away from your body so they don’t rub against you when hooping. Time to cut. Instead of starting with a knife, I prefer to start by drilling small pilot holes. Let’s start with the hole for the jack because its the easiest. I use my trusty black and decker screw driver and drill bits to create a small hole where the jack will go. Then I go up in size to a 1/4″ bit. Your final hole size should be 3/8″, that bit is too large for my power screw driver, so I carved mine out with a knife. But if you have a standard power drill you can use your 3/8″ bit to finish the job. Now take a marker and draw the shape of the hole you need for the switch. You can start by making two holes with a 1/”4 drill bit and carving the rest with a knife. Or just use a dremel tool to cut the rectangular hole. Just make sure to go slow and start small and keep checking the fit to your switch so that you end up with a snug fit. Now you are ready to fish the LED wire through the tube. I recommend using a stiff wire. A really cheap source is from the window installation section of a hardware store. The brand I used is called OOK. Its basically 22 Gauge galvanized steel wire, it even comes with a built in cutter. I think its $3 for 100 feet. You’ll need about 11 feet of this stiff wire. Basically a bit more than the length of your tube. The concept is simple, send the stiff wire through the tube first so you can use it to pull your wire through the tube. The LED wire alone is probably too flimsy to push through the tube on its own. 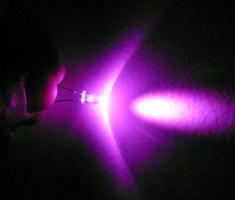 You should have some extra slack at the end of your LED wire away from the LEDs. This is the end that will eventually be attached to the switch, jack and battery. Tie the stiff steel wire to that end of the wire. To get the wire to align properly with the switch hole you will need to insert the stiff wire into the end of the tube opposite the switch. When you are done pulling the wire through you should see something like this. Your last LED is on your right. DO NOT pull any further, that last LED might slip into the tube and drop too far, and you’ll have to start over again. Now slowly pull the wire until the last LED falls into the tube. 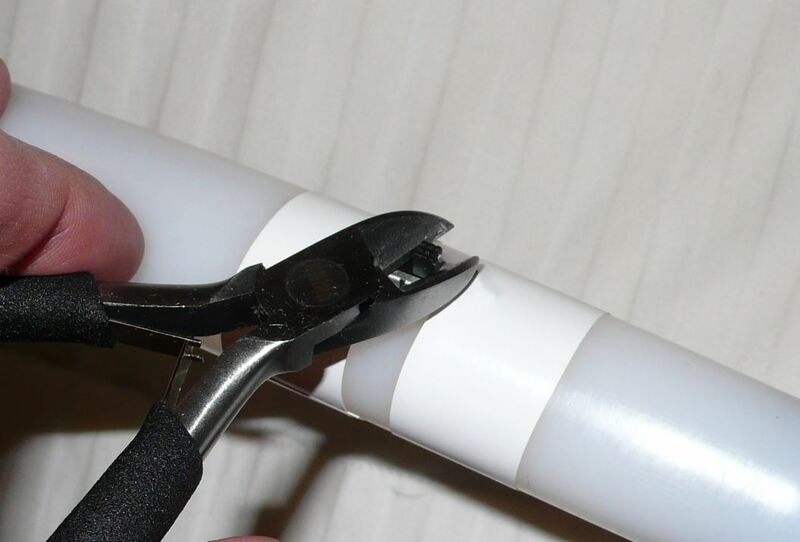 Tape that end of the wire to the tube so that it doesnt fall in while you work on attaching your switch. Remove the stiff wire from the LED wire. Bend a standard wire paper clip into a hook so that you can pull out one of the wires. You should try to choose the positive wire so that you match the schematic above but its not absolutely necessary. If you followed standard convention your positive wire is the one WITHOUT the white stripe. To maximize your LED coverage try to keep the nearest LED as close to the switch as you can. You should be able to see it through the switch hole. Cut the wire and strip the ends. Insert one wire through the hole of the middle terminal of the switch, and the other wire through one of the outer terminals of the switch. I usually pass each wire through two terminals for added strength but its not necessary. Just make sure that the strands of wire of one end do not touch the strands of the other end. Check your circuit: Now is a good time to strip the ends of your wire and attach your battery temporarily just to see if you switch works properly. If everything works properly you should go ahead and solder the wires to the switch for a permanent connection. Make sure the wires are not shorting to each other. If you want you can wrap each terminal with electrical tape as a precaution. Use a paperclip hook to pull up BOTH wires through the DC jack hole. This means you are pulling up both the positive and negative wires. Unlike in the photo below I recommend you push the switch down its hole first and then pull the wire through the DC Jack hole. Otherwise you will have too much slack between the DC jack and switch. You are now going to cut the wire like you did for the switch, but you have to reattach the both ends of the wire you cut to the same terminal of the DC jack. Start with one wire at a time. Cut the positive wire first and strip the ends. Strip the ends long because you will insert one of the ends through the hole of the positive DC Jack terminal, solder it, and then wrap the other wire to that same terminal and solder it also. Make sure you are connecting the positive wire to the positive terminal. This is very important because later you will attach the battery. If the polarity of the DC jack is reversed the battery will send current back to the charger and you WILL destroy the charger! Testing the hoop by switching it on and illuminating the LEDs only indicates the battery is connected to the LEDs properly, it does not prove the DC jack is correctly attached. Check this photo again to make sure you know which terminal is which. Now repeat those steps for the negative wire onto the NEGATIVE terminal. since this connection is awkward you need to tape the terminals of the DC jack to prevent a short. Cut strips of electrical tape in half to make it easier. Gently push the DC jack flush against the tube surface. You can see its a bit close to the switch, my tape covers some of the DC jack but its ok.
You can also use some glue to keep the DC Jack in place if it is not tight enough. I used Duco Cement, but crazy glue or epoxy should work as well. Take this opportunity to cut off the switch lever. You dont need it and it just gets in the way. **See separate instructions if using the new flexible tubing here and return to this page. Now you can pass the remaining LED wire through the connector and push the connector into the tube. You would do this by heating the tube with a blow dryer. ****You would still want to modify the other end of the connector by filing down the sharp teeth because you may need to take the tube apart in the future for repairs or to collapse the hoop into a spiral. Follow Step Eight of my LED hoop instructions for more detail. Insert the connector and see how much wire you need to cut. Cut the battery wires short and solder them to the LED wires. You don’t want too much slack. NOTE!! !Take your time to make sure you are connecting the black negative battery wire to the negative wire of your LEDs. As stated above, if you connect your battery in reverse polarity to your DC jack you WILL destroy the charger. Un-tape the other end and cover any exposed wire if you previously stripped that end of the wire. Push the wire into the tube to make way for the battery and connector. Now gently insert the battery into the tube, it should be a tight fit. You can simply use the connector to push the battery into place. Push the tube ends together until they close. Slide your switch to the on position. All of your LEDs should light up. If your battery is completely drained you will at least see red light from the color changing LEDs. Take some electrical tape and seal the part where the two ends of the tube meet. Plug your charger into your wall outlet. The charger has an indicator light that should be green. Make sure the power switch is in the off position. Insert the plug into the DC Jack of your hoop. Push all the way down until you dont see any more of the silver metal plug. The charge indicator should turn red which indicates the battery is charging. It will only turn green when your battery is fully charged which should take about 1 hour. DANGER!! – If the charger light doesn’t change to red when it is first plugged to the hoop, or if it turns off when you plug it into the hoop you must unplug the charger immediately!! This might mean that the polarity of the DC jack is reversed. If you left the charger plugged in like this you WILL destroy the charger! The battery used in this Rechargeable Upgrade Kit is the latest in rechargeable battery technology and is very safe. In fact it is safer than the battery in the computer sitting on your lap, or the cell phone you hold right against your face! But like all rechargeable batteries there are some things you need to do to keep your battery healthy. In this particular case you only have to remember two things. 1. Always turn off your hoop when the battery has drained to its minimum voltage. 2. Store the hoop in a charged or partially charged state. If you have created a hoop with the basic colors of 7 blue, 7 green, and 7 color changing, then the hoop will only show 7 red lights when your battery is drained. These are the color changing LEDs. This indicates that you are at your minimum battery voltage. At this time make sure you turn the power switch off and avoid turning it back on until after you partially or fully recharge your battery. If the battery is partially charged it will light up all the LEDs in your hoop. It is ok to store the hoop in a fully charged state, or even a partially charged state. But if you accidentally forget to turn off your hoop and the hoop shows 7 red lights for some time, chances are you are draining the battery below its minimum voltage. If you don’t recharge your battery immediately you risk permanently damaging the battery. If the battery becomes damaged in this way, you may never be able to recharge it again! Gasp! So to play it safe try not to use it as a mood light, cause you’ll probably fall asleep, the lights will dim, the battery will drain for hours past minimum voltage, and it might never wake up. What if I plan to be in an area without any outlets to recharge with? Just plan to turn off the hoop as soon as you see the red LEDs. The hoop and battery can be stored in this state for some time, at least until you get back home for the recharge. If I’m using the flexy tubing are the AA or rechargable batteries my only options and is one better than the other with that tubing? Is there a car charger available or can it only be recharged at a regular outlet? thanks! ok whoops I see that I would purchase the core kit rather than the upgrade if I’m making my hoop from scratch right? And I was wondering about the lithium battery since its cheaper, how difficult is it to replace those? thank you! do you have to use 1″ tubing. I prefer smaller hoops so I want a 3/4″ hoop but also want the conveince of the rechargable… is their an option for 3/4″ rechargable? is the transparent tubing lighter weight then standard tubing? How much will the hoop weigh upon completion? what is the voltage for the recargable charger? Cecilia, first keep in mind that we are talking about a tubing with 1″ for the outer diameter. if you are familiar with the term “3/4inch 160 PSI tubing” for an adult hoop, then that is the same as tubing with a 1″ outer diameter. To be exact, the tubing is 1″ outer diameter and about 0.814″ on the inner diameter. The rechargeable battery is about 0.8″ in diameter, so it just barely fits the 1″ x 0.814″ standard hoop tubing size. I was curious if the rechargeable batteries you use are NiMh or Lithium Ion? and what is the total voltage and mAh of the rechargeable batteries? I am having an issue with the battery staying attached. it is well soldered but it pulls off while hooping. I have fixed it once already and now I am worried I won’t have enough wire to fix it again. What is going on? Hi julia that’s quite a project you have ahead of you. Unfortunately super hooper uses 2 CR batteries, together they produce 6v. 6v is more than any led needs, which means that somewhere in the wire, possibly for each led there lies a resistor to limit current to the led and avoid burning them out. The prodmod batteries however are 3 to 3.6v. This allows prodmod to avoid using resistors. But it also means that one 3V battery is not enough to power your superhooper hoop. In order to use 3V batt u can either remove the resistors in your hoop. If there is just one you are in luck. But if each led has a resistor than it’s not worth the effort. You may as well make a new led wire set made for prodmod hoops. Also a 3V batt without resistors should not power red, yellow, or orange LEDs. They still need a resistor. So take a note of what colors you have and whether there is one resistor or many and go from there. I just finished making my hoop! I’m so excited! I also bought clips from thespinsterz.com to make it collapsible. I plan to make another one that can dismantle into 4 parts. But of course I will need 4 battery compartments to have each wired separately. Thank you so much for the kit and directions! I’ll be buying from you again! *excited squeal* I can’t wait to show off my new hoop! can get is 1000, but it’s possible to win up to 25000 how buys junk cars those who wish to adopt this loan against any collateral or security can opt for that secured affordable money advance loans. which is the voltage of the battery?